We know how important relaxation is, especially in today's fast-paced, traffic filled world. This treatment is designed to integrate the best of Neuromuscular (commonly known as Trigger Point), Deep tissue, and Injury massage therapies. Combining these techniques addresses the underlying pain from repetitive motion injuries, while manipulating the muscles and tissue on a deep level, along with bringing out and addressing specific points of pain within the muscle. This therapy creates a deep, and lasting relief of pain, as well as stress relief and relaxation. Our version of the "fluff & buff" massage! If you are in need of something soothing, without the "hurts so good" feeling of deep tissue- this massage is for you! Sometimes, we just need to relax and get away from the stress of our daily lives. This massage is designed with light pressure - so no recovery time afterward. Just relax and enjoy a soothing touch to release stress and then float home​. Heat is one of the best ways to release stress and tension! 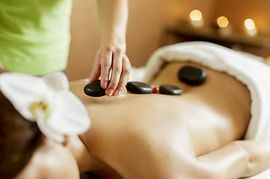 We use slow-heated basalt stones as the primary tool for this warm and relaxing massage. The heat melts away muscle pain for a deeper and more soothing treatment. Perfect for a gentle recovery from a tough workout, or a long day at the office. Bask in the glow, so you feel refreshed and ready to step back into your life. Appointments may be cancelled with no charge 24 hours in advance of the scheduled appointment time. Appointments cancelled within the 24 hour window may reschedule to any new time during the following 48hrs. The FULL list price will be collected as a deposit toward the new appointment, and will be applied toward payment upon completion of the service. Appointments that are cancelled & not rescheduled within the 48 hour window, or, are a no-show for the scheduled appointment, will be billed 100% (full list price) of the scheduled service. Failure to pay may result in collections actions.